Essentially, a gateway acts as a peripheral to existing sensors and actively streams data to a client-accessible database. BluCloud [www.blucloud.tech] was founded to make environmental and industrial sensing easy and affordable. Through our custom sensor solutions such as DeepBlu and IoTa, our customers have been able to order and deploy the right package for their use case to collect the data they need. Taking into account market needs, all our products are designed around durability, scalability, and affordability. After a number of successful iterations on our connected sensor lines, we recognized another aspect of the sensing industry without a suitable optimized solution. Too often, existing sensor deployments measure and collect data just to store it locally on the device itself. This means that professionals have to physically visit each of their sensors to retrieve and analyze the data, a cumbersome process that greatly increases the effective response time to measurements that require attention. Moreover, such systems are commonly too complex and costly to replace with an entirely new set of connected sensors. An elegant and comprehensive solution to this dilemma is a cellular gateway. Essentially, a gateway acts as a peripheral to existing sensors and actively streams data to a client-accessible database. In turn, your data becomes available anytime and anywhere. Well-designed gateways can be installed without extensive rewiring and can be preconfigured to begin streaming instantly upon activation. Real-time cellular connectivity as allowed for by cellular gateways provides not only the apparent remote monitoring capabilities but also the hidden benefits of remote control and automation. Even with the most precise sensors, the ability to act on the conditions being sensed is impeded by the barrier between you and your data. Only with real-time access and action can you extract the full value from your sensor systems and optimize your critical processes. Since the local storage and data streaming components of gateways are ideally completely configurable, they can additionally function as human-machine interface (HMI) data concentrators in which data is recorded and processed locally by your sensors, and select data fields are streamed by a gateway to a database for remote access and analysis. According to a 2016 Control Engineering feature [https://www.controleng.com/single-article/harvesting-storing-and-accessing-industrial-data/66b285e60bee6e15e3a6adfa7c4aa563.html] cloud-connected data concentrators offer the best balance between local and remote storage for most applications, and the ability to customize to your specific data requirements facilitates security and scalability. The undervalued consideration of cellular gateways is that their added utility is, in fact, exponential, enabling functionality far beyond remote data storage. In response to industry need for cellular gateway applications, BluCloud has expanded its focus development and product lines from custom sensor packages to IoT-enabling cellular gateways. Our gateways are of course compatible with BluCloud sensor packages, but we designed them to be “omni-compatible” to integrate with any sensing instruments on the market or already in the field. In doing so, we hope to help scores of people bring their devices on to the Internet of Things and make smarter and more informed decisions. 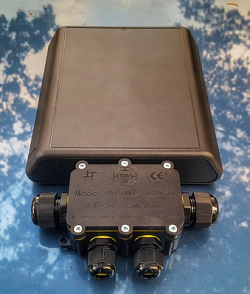 BluCloud gateways use seamless waterproof connections to interface directly with the data output channels of your sensors. With this simple and easy connection, your device continues to operate exactly the same, but our gateway independently streams the device’s selected data with no setup or maintenance required. Our cloud database further empowers you to visualize the data and perform projections that you otherwise would not generate with offline local storage. And, as is essential but available in surprisingly few gateways currently on the market, our cellular communications module is optimized for two-way communication which enables remote control and reconfiguration of the behavior of both the gateway and your device. Based on our success deploying cellular gateways in agricultural, marine, and industrial applications, we strongly believe in the value of integrating gateways into existing systems as a sustainable IoT solution. The insights enabled by making data accessible simply cannot be understated. Going forward in industrial sensing, core values must be durability, scalability, affordability—and accessibility.